Also, looking back my writing has improved dramatically. For similar fun look Here, Here and Here. How is that for plugging? 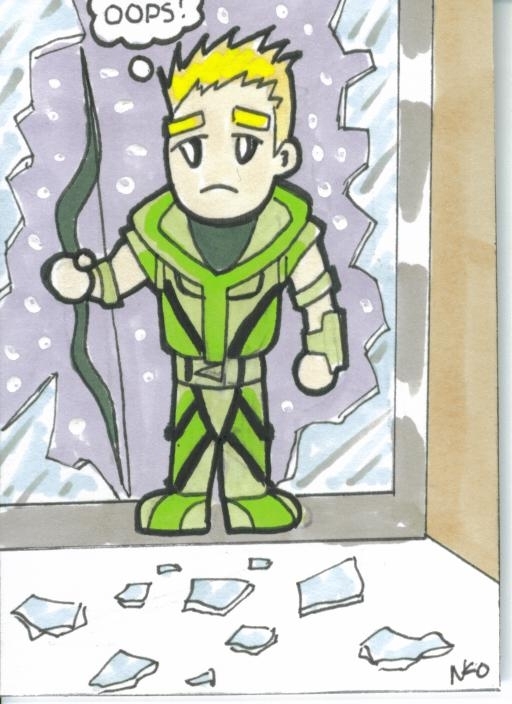 So I love Green Arrow, I love his silly themed arrows, I love his Robin Hood riff, I love the evolution of the character, his relationship with other figures, especially Batman, Hal Jordan and Black Canary, the socialism he picked up along the way, his one arm, his two arms. He, to me, is a perfect example of how a great character doesn't explode into popularity, but steadily builds it up. Anyway, where was I? Oh yes, the New 52. Now I had been feeling the pinch slightly, as mentioned in my Batman review, that little sting where you are reminded that all that beautiful, convoluted canon you have kept up with for your comic book reading career, is...for now (more on that theory later) lacking relevance. This, to an extent has been diminished by the fact, but some strange, yet oddly effective plan, the Batman and Green Lantern universes (primarily) have kept many of their little quirks, with such things as The Killing Joke, and Blackest Night, still being seemingly in the canon. We find ourselves with all four earth lanterns, and a full house of Robins and Bat-suffixs then I care to shake a stick at. Overall they are a great set of three comics thus far, establishing a solid universe and a cast of new media obsessed rogues, Green Arrow is effected slightly by Dark Knight syndrome but they add enough unique twists into his Queen/Arrow balancing act to make it compelling, he comes complete with two tekkies, hits the ground running, and hopefully soon, he might grow a beard.